Synopsis: Basically another whole class reincarnated in a fantasy world story, with one tiny little difference. MC is reborn as a spider and it's survival of the fittest from the get go. She proceeds to gain skills, evolve, ect. The story is interspersed with side stories every 5 chapters to give the world background and check out what the classmates are doing. It's a fun little series with a good mix of comedy and serious tones. How about we ask a mod to move all the related post over here? Although it is a spider, what? Sounds better at least, so I'll switch it. The timeline is a bit confusing in this series. It initially seems like Kumoko is born much later than the others, with the sides occurring at the same time in different places. Now we know that's not the case because of the stolen silk, but the exact time difference is up for debate. She's at least as old as the others though, which means when they do find her(or she finds them as the case may be) she's going to really OP compared to them. It also means she probably spends years in the labyrinth, so I'm expecting time skips once she stops leveling so damn fast. the girl has a heart of steel, you think 10 years of entire solitude as a spider in a dark dungeon is going to affect her? I don't know. I know her type of gamer, same as myself. Hermits can go years without saying a word to anyone and it wouldn't feel any different. She'll be fine as long as she has something good to grind. you know what's funny the heroes scarf is actually made from her web. question; how big of a spider is she???? 1 meter long (3 feet) as of latest evolution. will she become something like this? That's not the plan at any rate. Kumoko favors the assassination and magic approach, plus she needs to be small enough to leave the labyrinth when she's ready. Current plan seems to be to become an arachne. She's already seen the evolution tree and it's a possibility at least. 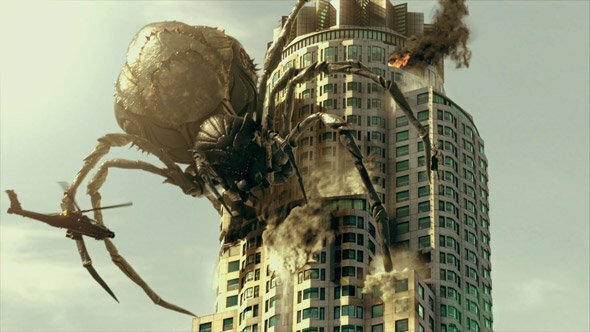 Her mother is a 30 meter long giant spider though, so it looks pretty close to that pic. does Mommy knows her kiddie is not from that world??? Does she ever gained a shape-shifting skill or a skill to turn into human? It's not that I'm a monster. Uhhh, she may be mommy but she's still a spider. Moments after being born she eats one of her children as a snack. Not a parenting figure, that. The story has Kumoko fleeing and figuring things out on her own. The mother is only encountered again way later blasting some offending monster into dust and unintentionally scaring some caution back into the protagonist. now now, don't say that. I've known a few women I wish were smart enough to eat a few of their kids. I'm sure her only regret in the end will be that Kumoko wasn't one of her snacks. is she the only one that's nonhuman? you mean are there other intelligent demons, or do you mean are there other classmates who are monsters? She's the only monster reincarnation.